One of the world's largest MMORPG publishers uses iovation to keep their games safe for their valued players, and the fraudsters out. 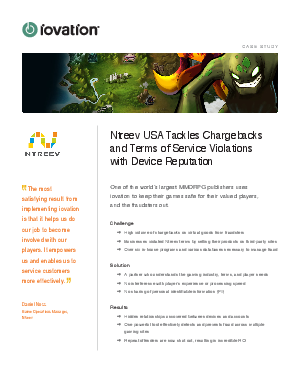 Ntreev USA specializes in online game development and publishing. They publish three games including Trickster Online Revolution, Grand Chase and PangYa. Working with iovation ReputationManager allows Ntreev to protect their valued players from online abuses, as well as potential fraud such as identity mining and credit card abuse.